As for your nativity, on the day you were born your navel cord was not cut, nor were you washed in water to cleanse you, you were not rubbed with salt nor wrapped in swaddling cloths. No eye pitied you, to do any of these things for you, to have compassion on you; but you were thrown out into the open field, when you yourself were loathed on the day you were born” (Ezekiel 16:4-5). God began His declaration of love for Jerusalem with her birth, a child of Canaanites, struggling, unsanitary, bereft of rudimentary natal care. No tender parent cut the cord and washed away the blood; no gentle hand rubbed with salt or swaddled with linen. Apart from God’s intervention, Jerusalem would have died in its bloody iniquity, as surely as an infant abandoned in a field would die. God said that out of compassion He gave Jerusalem a chance to live. “Live!” Yes, I said to you in your blood, “Live!” (Ezekiel 16:6) He washed her with water, anointed her with oil, and blessed her with luxuries, clothing of linen and silk, leather sandals, earrings, bracelets, fine pastries, honey and oil. Because of God’s love, Jerusalem was splendid and beautiful, briefly. I was acquainted with three of the procedures mentioned in Ezekiel 16:4, cutting the cord, washing with water, and swaddling, but rubbing a baby with salt was unfamiliar to me. This scripture is the only bible reference to the practice of salting a newborn, and it raises the question of what does it mean? Was it a pagan custom or a standard procedure in the ancient world? If it was a common procedure, then why was it done? Commentators looking into the use of salt on newborns agree that it was “an ancient practice,” common among Jews, Christians, Arabs and others, either for ritual purposes, medical purposes or both. It is thought that babies may have been sprinkled with a few grains of salt as a ritual to signify integrity, purity, and dedication, patterned after salted offerings made to God (Leviticus 2:13). It may have been that parents salted their children to ward off evil spirits. However, the Bible doesn’t say that salt protects an infant from spiritual harm or that God requires babies to be dedicated to Him through salt ceremonies. Historians cite some traditionally accepted beliefs for washing babies in salted water, or rubbing them with salt powder, or massaging them with salted oil. The earliest documentation they mention is a treatise written in 100 AD by Soranus of Ephesus, a Greek obstetrician, pediatrician and gynecologist who practiced medicine in first century Alexandria and Rome. Soranus’ work set the standards for medical treatment of women and children for 1500 years. In his document, “On Midwifery and the Diseases of Women,” Soranus recommends sprinkling babies with powdery salt to cut through any placental remains and birth residue on the infant’s skin. He believed salt mixed with honey, olive oil, barley juice, fenugreek or mallow should be massaged into a baby’s skin then washed away with warm water. The only other old reference I found was a comment attributed to Rabbi Isaac ben Judah Arabanel that salting the infant strengthened its skin. created an environment inhospitable to bacteria. If it is true that salting babies is so beneficial, then why isn’t it a general practice everywhere today? Current findings indicate there is good reason such a procedure is not advised and practiced, and caution that parents, grandparents, and caregivers need to be wary of salting an infant. “Even small amounts of salt can be dangerous” for babies’ kidneys and organs not equipped to handle “more than what is found in their mother’s milk.” However well intentioned, salt applied to an infant’s skin and in its mouth can be harmful, even fatal. In the course of interviewing the 112 mothers, the doctors learned the following facts: 48 mothers had been salted themselves as newborns, 37 mothers had salted their other babies at least once, 56 mothers thought it was advantageous to salt babies, 18 mothers knew there were dangers to salting babies, 5 mothers knew there were some harmful consequences but salted their babies anyway, 6 mothers salted their babies just because it was traditional to do so. A significant number of mothers continued the practice because it was passed on from their mothers and grandmothers. Many of the 112 mothers didn’t understand the dangers of salting babies. There was no agreement on how to do it, how much salt to apply, how long to leave the salt on, should it be washed off, should the baby be swaddled with salt on the skin, if so for how many days, what to do if the baby looks sick? Doctors referenced four sad examples of infants who had suffered from different kinds of salt treatments, with harmful effects ranging from skin scars to brain damage and death. The staff at Jordan Hospital continues to educate mothers about the dangers of applying salt to their newborns. As young mothers learn safe methods of infant care, the unsound traditions will be put to rest. Posted in Bathing, Ezekiel 16, Uncategorized and tagged Child Health, Childbirth, Ezekiel 16, Infants, Salt, Salting a newborn. Bookmark the permalink. How typical for the medical community to criticize an ancient practice because of pride that they necessarily have a better way. They should be more humble to remember for over 3000 years the medical establishment practiced blood-lettimg up until the 19th century. Strip all their medical potions, drugs and technology from those same doctors, throw them back in a poor middle-eastern country 1000 years ago with nothing but what was commonly available and see if they might find some wisdom from this practice properly administered. 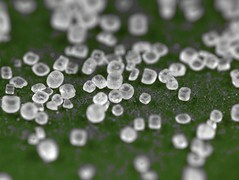 Salts, there are many kinds, were extensively used in ancient times from agriculture food preservation to medicinally. The least of which may have been seasoning food-table salt. Historically so called “medicines” were used manipulatively to gain additional income and were often harmful. People recognized this and often sought out simpler and more trusted alternatives as they do today. New mothers seek out knowledge from experienced mothers about practices best for their newborn. Some advice and practices are wise and some are foolish. Sadly, over the centuries most women who practiced “salting their newborn” were wise and used the right kind of salt in the right way. The medical establishment is quick to wholesale condemn a practice used incorrectly by foolish, ill-informed mothers rather than gently correct and recommend a proper usage of salt. Medicine knows many wise uses of salt. Some salts allow better transdermal absorption than ingesting. Salt is a concentrated substance in dry crystalline form so, as with many good things, less is more and safer, especially with newborns. Read, study, consult, pray and ask the Creator of salts for wisdom in this instance and any other. I was more than happy to discover this website. I need to to thank you for ones time for this particularly fantastic read! !